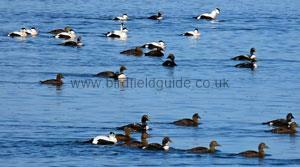 Note the very distinctive black and white appearance of the Male Eider in Winter and the wedge shaped appearance of the head. The Male Eider in Winter has white upperparts and black underparts. It's bill is large and wedge shaped and it has green patches on the back of the neck. The Males head is black on top and the breast has a pinkish tinge. 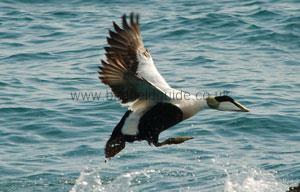 The Eider is a large marine diving duck feeding on shellfish. 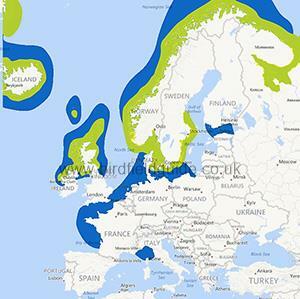 Breeds In Northern UK, Iceland and Scandinavia. Winters on the open sea down to western France. The Eider is a marine bird venturing into rocky low lying grassy bays where the Female sits in the open on her nest relying on her excellent camouflage to remain unseen. The Eider nests and winters in colonies of various sizes. It is a well known fact that Eider line their nest with down from their underside which almost led to their extinction in the 19th Century due to it's unequaled insulating properties for clothes and bedding. Eider are still farmed in Northern Europe for this purpose but it is done sustainably and small amounts are taken from the nest over the nesting period. 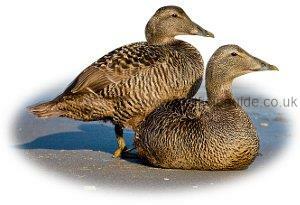 The Eider is a sociable bird spending it's life in small to large colonies, it is unusual to see an Eider on it's own. Males, Juveniles and Females sometimes form their own groups during the Winter. Male and Female Eider feeding on mussel. 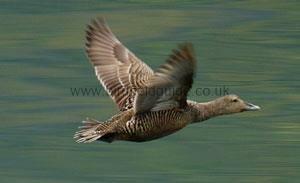 The Female Eider has a closely barred brown body throughout the year. The bill and head are wedge shaped, she has light bars on her underwing in flight and dark speculums. The Female Eider has light bars on the underwing, just visible in this image. Note the heavy appearance of this bird, the thick neck and rounded body help identify the Eider at a distance. 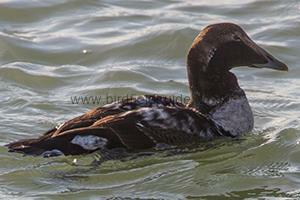 The Male Eider in Summer is mostly brown but is not barred like the Female. Depending upon the time of year the Male will have varying amounts of white markings.